Log on to your Voip.ms Control Panel. 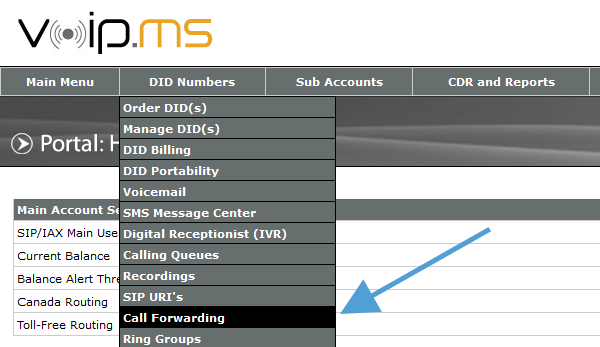 Click on DID Numbers and select Call Forwarding from the drop down. Click the Add Forwarding button above the list of current forwarding numbers. Enter the Nomorobo Number, shown in your control panel, into the phone number box. Type 'Nomorobo' in the Description Box. Click on DID Numbers and select Ring Groups from the drop down. 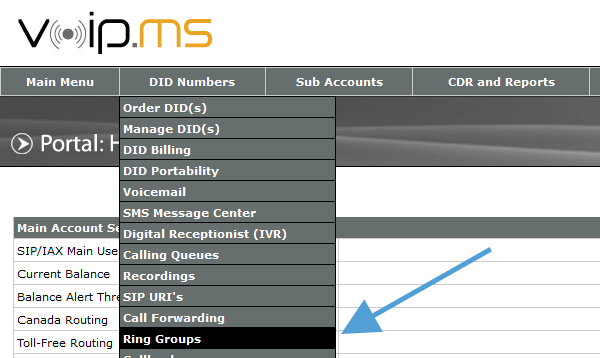 Click on the Click here to create a new ring group text link above the list of current list of ring groups. Type "Nomorobo" into the Description field. Check the box for the ONE DID number/subaccount you would like to add to the ring group and set the "Ring Time" to the number of rings you prefer (usually 5). Note: You can only select one DID number/subaccount and the Nomorobo forwarding group. If you have multiple DIDs/subaccounts you would like to protect with Nomorobo you must set up a ring group for each DID, but you can use the same Nomorobo phone number. Check the box for the Nomorobo forwarding group and set the "Ring Time" to "10s 2 rings". Click on DID Numbers and select Manage DID(s) from the drop down. Click on the edit button (the pencil) for the DID you're using. Select Ring Group and choose "Nomorobo" in the drop down. Click Click here to apply changes. After you've completed those steps, go back to your Nomorobo Account. Go to "Your Phones" and click "Test" next to your number. Then click "I'm ready. Call Me Now." You will immediately receive a call letting you know if everything is setup correctly. Please pick up the phone after the third ring. Your number will now be listed as "Protected".